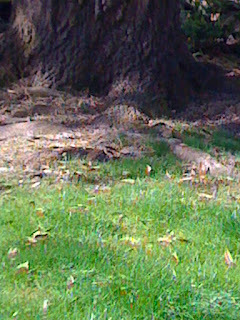 "Green grass continues to grow beside an old oak." The fact is that I’m part of the “middle old” (ages 75-84) and that right now my actual age doesn’t really correlate with my functional age. Although I’m supposed to have developed what is termed “neuron loss,” I don’t see or feel this creeping loss, and I also experience “negative affect” less frequently than a few of my peers. 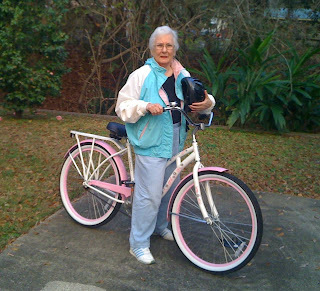 Besides, I do have that pink bicycle mentioned in an earlier blog on which I can pedal through some gray days. the old dog yipping at her heels. breath whistling in his yellow breast. be afraid of God, there is no time. With a little frame showing. Whoops! 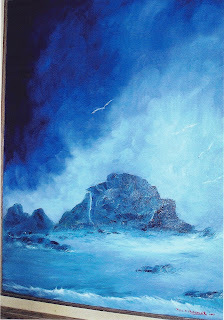 Nothing brightens my day more than the arrival of a photograph of one of my brother’s paintings. The most recent painting is one of the northern California coast–the magnificent rocks and water executed in varying shades of blue. Something about the one blue color gives me a feeling of peace, and I hope to put it on the cover of a new book of poetry I’m writing this year, which, at this date, only has seven poems in the collection. Another of Paul’s recent paintings features more rocks and sea and a small coast town on an island in the forefront of the painting. Although Paul’s eyes are failing, he seems to be able to render tiny houses and trees well, and I think he must strain mightily to execute his art at the age of almost-eighty. Many of his paintings are abstract ones I’ve used for my chapbooks, and his art often appears on the covers of novels I’ve published. Paul began painting and drawing when he created his first story about a bear that my father introduced at bedtime called “Jimmy Bear,” and he was encouraged by my mother who painted pictures of gnomes, fairyland creatures, forest scenes featuring huge frogs and dwarfs holding paintbrushes. When Paul moved to northern California nearly twenty years ago, he began painting again in earnest–no lessons, no art school–just the paintings that reflect memories of Louisiana, gardens and flowers, seascapes, landscapes, and brilliant abstract renderings. His garden and yard also reflect his artistry and are paradisiacal scenes. outside my window and within me. on which our history ripples. 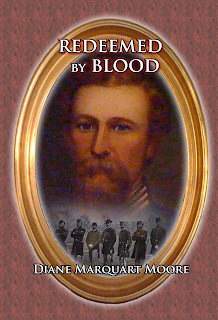 For the New Year’s reading, my latest book, Redeemed by Blood, has been produced “in print” and will be available on www.amazon.com in the next day or so. (I will update this post with a link when the book is available.) If the more-than-500 readers who took advantage of a freebie Kindle offer during a five-day period are indicators of reading enjoyment, those who like to hold the actual novel in their hands and to place it on their bookshelves should welcome this print edition. Redeemed by Blood spans five generations of a southern family haunted by the ghost of a Civil War veteran involved in a black/white debacle, carrying the reader through the War Between the States, the rise of the KKK, and violence that affects several generations. Dade Green, in the form of a poltergeist, appears to each generation to warn them about the outcomes of racial prejudice. The surprise ending involving Dade’s great-great-great grandson brings resolution of a family issue and the release of a tormented soul who has witnessed all the horrors of war and slavery. 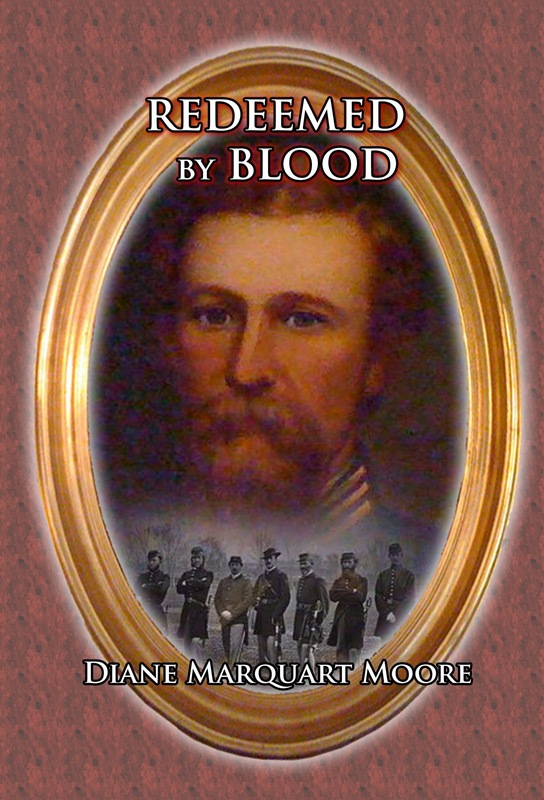 Most of the writing of Redeemed by Blood occurred while I sojourned in Louisiana last year, with forays into the memorial park at Shiloh in Tennessee and visits to north Georgia for material. Pertinent research was also done concerning Virginia Military Institute, the Civil War, railroads in the old South, the transcendentalists, and material from two personal diaries. 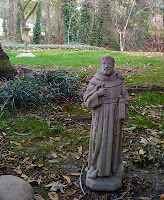 St. Francis oversees grass at our address. Sometimes the light on gray, fog-ridden days of winter in Louisiana equal those early spring days in "Grayburg," the name I coined for Sewanee, my other home on The Mountain in middle Tennessee. In Louisiana, the slate colored sky hangs above my window overlooking the backyard, and for awhile, I looked out at dreary bare earth under the oaks–a wide patch of brown where grass struggled to grow even during warmer months. The scene has been transformed. We planted perennial rye grass, which my father called “winter grass.” It was a simple procedure in which we sprinkled seed after raking the dirt, then applied a thin layer of topsoil and watered the soil. Almost overnight, the seeds germinated and grass began to poke through, a miracle of green that makes my heart lift when I sit down to write at my desk overlooking the yard. I know that by the time I leave in mid-March, the beautiful dense field will have begun to fade, but for now, the sea of bright green challenges any gray day to depress me. It’s a morning blessing that could be perennial, as the label on the seed package indicates. When I was about eleven, my father moved us into a new stucco house in Franklinton, Louisiana where the yard stretched over two lots in a sparsely-populated subdivision. We had just returned from the famous Diddy Wah Diddy trip, which was an odyssey to California in a blue Ford coupe that pulled a gray utility trailer filled with our earthly goods. We were to become gypsies, my father said, and somewhere in that California desert was the place of his dreams where we would encamp forever. When this small-town boy from Lake Arthur, Louisiana encountered L.A. traffic, (even in the 40’s! ), he turned around in the middle of the city and began driving east toward Franklinton. When we arrived at the house with the barren yard in Franklinton, I thought we had reached paradise, and after he planted the “winter grass,” I felt some hope that we would be a secure family again. By that time, my mother’s and father’s “compass needles had run awry,” (as I fictionalized in my latest novel, Redeemed By Blood) and no sea of green would ever balance them again. 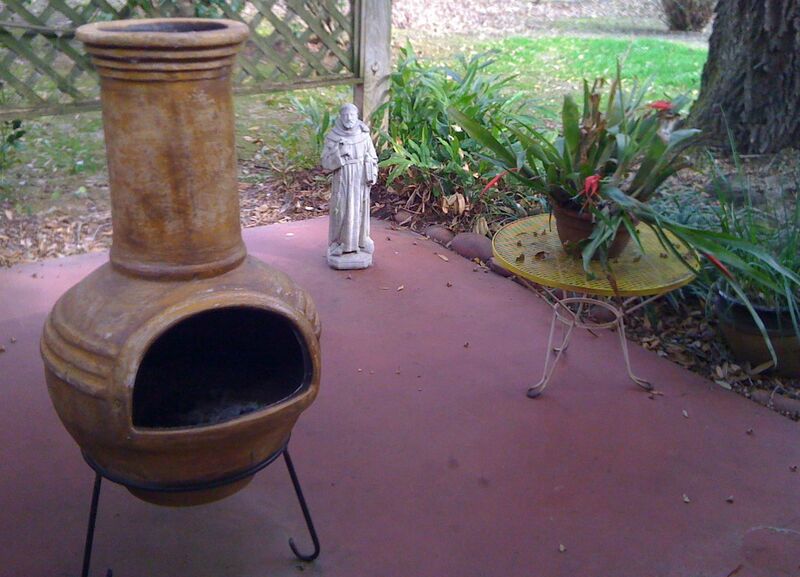 Patio and new grass and yes Saints can move. Today, the house in Franklinton has been pushed up, the bare earth is dusty and unfertile on the two lots, and the Roman Catholic Church behind the property has claimed the ground. I hardly ever visit this scene because it evokes sad memories of the days of the light green grass of security. This is the first winter I’ve dared to plant the “winter grass,” and in my seventh decade, it represents a measure of “settling in” for me. 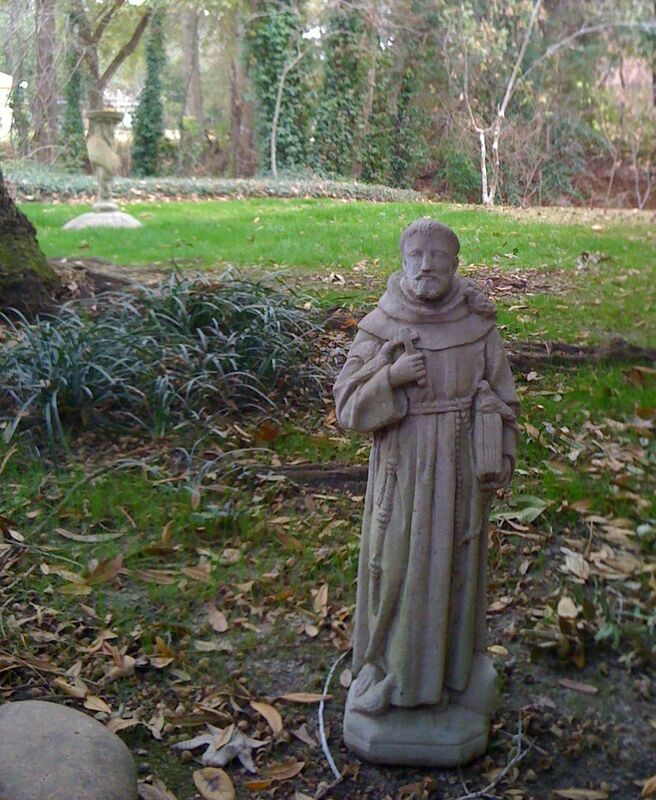 A stone statue of St. Francis holding a bird and “The Book,” a rust-colored chimenea, and a lone bromeliad with red blossoms overlook the expanse of green. The scene outside my window isn’t a lush garden or any more than a block of concrete painted red, bordered by winter grass, but it’s enough of life outdoors to give me a feeling of peace. Ready for another ride on the Pink Flyer! Most people who have been cyclists can tell you the exact year they learned to ride a bike. I was seven when I attended a birthday party in Lake Arthur, Louisiana where the most important moments of the party weren’t cake and ice cream or opening be-ribboned packages – it was the opportunity given each child to try out their cycling legs. I don’t remember what the bicycle looked like, but I do know it was an adult bike (bikes with training wheels were unheard of in the 40’s), and I balanced myself and wobbled off on it at first try, experiencing the exhilaration of what I imagine a baby bird feels when she makes her first flight. The year was 1942. Almost seventy years later, this past Christmas, I received a new bicycle, a gift from my oldest daughter Stephanie, who had called me daily before Christmas Eve, asking, “Are you sure you want a bike for Christmas? You could break your bones? All the ones with foot brakes are really ugly anyway. You are older, Mama.” Well, despite threats that she would give me a bike so unattractive that I’d be embarrassed and give up the idea of riding a bicycle again, she made sure that the bicycle was a beauty. It’s a pink and white Schwinn, complete with luggage carrier and a bell on the handlebars, super “stop quickly brakes” (more about that later), and white sidewall tires. It’s a real wowser! Christmas Eve, the family, including my great-grandson who can’t walk yet, gathered on the drive to watch me pedal off on this pink baby. “You looked good,” they unanimously declared, and I felt strength surge in my legs and arms, assuring them I would cycle faithfully. Well, rain has fallen, temps have dropped and risen, cloudy days have passed, and every evening since Christmas Eve, I have lingered on the glassed-in porch and eyed the pink and white Schwinn. The porch contains a Granny rocker and the pink bicycle, and they seem to symbolize two choices – choose senility in the rocker or choose life by riding the bike. Finally, yesterday, I strapped on the sinister Darth Vader-like black helmet and took off. No cape fluttered in the wind, I wore no metal breastplate or leather undersuit, but I resembled the Phantom Menace looking for a victim to run over as I raced with the wind down the runway of the drive. No family members presented themselves to see me take off, and I accelerated easily on the first mile around the neighborhood. At one point, after I had negotiated a curve, I took my hands off the handlebars to see if I could stay balanced (I rode without hands throughout my teens). That feat only lasted two seconds before the bike began to wobble. Three of my favorite birds, purple/black crows, circled above and cheered me on. “Connie Carpenter (gold medalist )?” the first bird asked. “Nah, Rebecca Twig (silver medalist),” the second crow jeered. “Nah, Sandra Schumacher (bronze medalist),” the third bird said. Then they began arguing among themselves about whether I was in a “road race” or a “time trial,” and I left them appraising the quality of my ride. “It’s a cinch she won’t join 92-year old Eileen Gray when she carries the torch in the London 2012 Olympics torch relay races,” I heard them agree as I sailed around the corner near the apartment complex. “Well, she has aged, but like Eileen, she was a WWII cyclist too,” the kindest of the ravens declared. On the second mile, I ran into my handicap – a golden colored Shih Tzu, weighing in at eight pounds (otherwise known as a lion dog in China and a descendant of the Chinese wolf, but really a very small dog with a ferocious bark). All eight pounds ran to the curb and snatched at my blue jeans, breathing heavily (these dogs develop breathing problems at some time during their lifetime) on my tennis shoes, but I pedaled free and dared it to follow me by touching my hand to the Darth Vader helmet as if invoking a curse. When I had pedaled for twenty minutes, I made a perfect turn into my drive and arrived at the glassed-in porch, braked quickly and fell off, my legs becoming entangled in the pedals. I landed on my Darth Vader cybernetic right arm at the elbow where blood began to flow as if I wasn’t fooling anyone about having a cybernetic right arm. I looked out at the street where one of my neighbors had stopped her SUV at the end of the drive. “Are you o.k. ?” she asked, watching me attempt to disentangle my legs and come to a sitting position. I was determined for her not to see my bleeding elbow and flattened out on my back, then did a fast sit up. “Just braked too quickly,” I replied, waving her away with my left arm. She didn’t budge the SUV until she saw me walk to the door of the glassed-in porch. No blinds were raised in neighboring houses, no fire truck or ambulance arrived, and after I had calmed myself in the Granny rocker on the porch, I headed to the icemaker to freeze my wounds. In an e-mail to my most caring Bishop yesterday, I mentioned the fall, and he fired a message back this morning, asking, “May I enquire how long it has been since you rode a bicycle?” I figured that I gave up the sport in 1984, the year that the three women mentioned by the crows won the Olympics. I know, I know, when a horse throws you, climb back on. Maybe tomorrow. Today is the Sabbath, and I believe in a day of rest. But the Pink Flyer will ride again. Diane's drawing of her favorite bird. 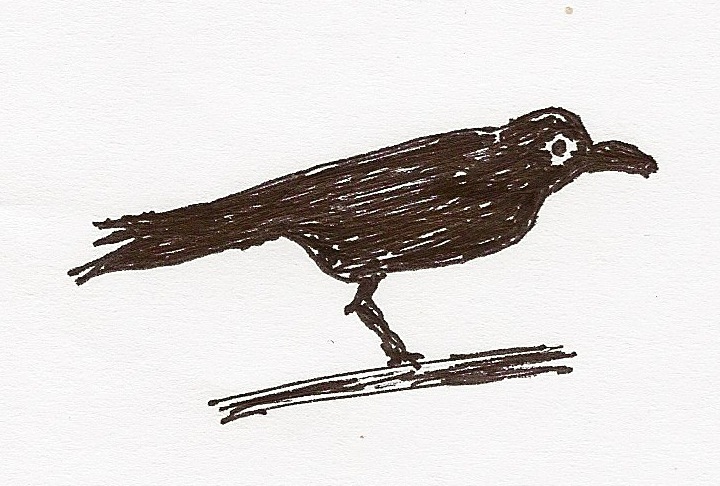 How many reams I’ve written about crows, much to the annoyance of people who regard them as public nuisances! This morning, the first relaxed morning I’ve enjoyed in the New Year, I went outdoors to look at a sea of newly-grown rye grass and above me I heard the familiar caw of my favorite bird, the crow. 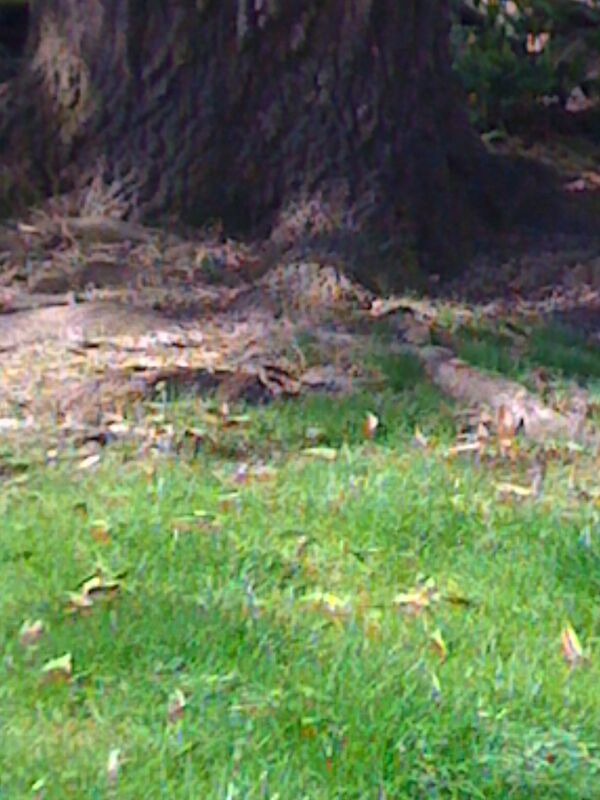 It perched at the top of a towering oak near the coulee, eyeing me and talking (yes, crows can even learn to speak words and short sentences more clearly than parrots!). Crows, the most intelligent of all the birds, are reputed to be guardians of the hidden and sacred, as well as interpreters of the unknown, but if you don’t have a drop of Scots superstition in your bloodline, as I do, you probably won’t regard them as masters of mystery or messengers who remind us to pay attention to connections to our ancestors. Despite the cold this morning, I stood awhile in the yard, clothed only in my pajamas, and made echoing caws, but the crow turned up his “nose” at my poor imitations of its birdcalls. I think it may have been trying to drive a hawk away, as crows dislike hawks and owls, but he may have been trying to convey news of what is going on in town. In Nordic mythology, the god Rodin had two crows named Hugin and Munin who went about gathering news of happenings in the world, then would fly down and sit on the god’s shoulders, informing him of what they had seen. However, the crow this morning may have been looking for plant materials to create hooks that he could use to remove grubs from old logs –crows are experienced toolmakers. Crows hover over the Tower of London in the UK, and some people (probably Scots) believe that if they disappear from the Tower, the English monarchy will topple. According to the superstition, Beefeaters (guards of the Tower) make sure that ravens have a home in the Tower so their kingdom on this earth won’t perish. In 2007, the skies suddenly began to rain cane toads in Australia, and when scientists investigated the cause of this phenomenon, they found that crows were the culprits. They had toppled cane toads from tree limbs, then swooped down and carried them back to the limbs to consume the insides of the reptiles. People in this remote Northern Territory of Australia seem to prefer the crows to ugly cane toads.